Did inflation heat up in July? Last Week in Review: Home price gains were strong in June. Did inflation heat up in July? Research firm CoreLogic reported that home prices, including distressed sales, rose 6.8 percent from June 2017 to June 2018. Prices were up 0.7 percent from May to June. However, gains could slow over the next year if further increases in home prices and home loan rates erode affordability. 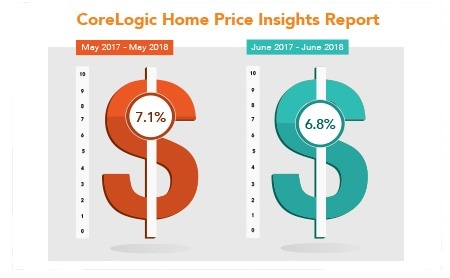 CoreLogic forecasts a 5.1 percent increase in home prices from June 2018 to June 2019. The National Association of Home Builders also reported that rising home prices and higher home loan rates caused housing affordability to hit its weakest level in a decade in the second quarter of this year. There was news on consumer inflation, as the July Consumer Price Index (CPI) rose 0.2 percent from June, which was in line with estimates. Core CPI, which strips out volatile food and energy prices, also matched estimates with a 0.2 percent monthly increase. While these monthly numbers were tame, on an annual basis Core CPI rose 2.4 percent when compared to July 2017, which was the largest 12-month increase since the period ending September 2008. Inflation at the wholesale level was tame in July, as the Producer Price Index was unchanged from June. The bottom line when it comes to inflation is that fixed investments like Mortgage Bonds lose value when inflation rises. Home loan rates are tied to Mortgage Bonds, so rates can tick up when Mortgage Bonds worsen. That’s why inflation reports are always some of the most important to monitor.